by Elwell, Walter A.; Yarbrough, Robert W.
Studying the New Testament can be an exciting--and intimidating--experience. This readable survey is designed to make the adventure less daunting and more rewarding. Two senior scholars offer a new edition of their bestselling and award-winning textbook, now with updated content and a new interior design. An accompanying website will offer a wide array of resources for students and professors. Other distinguishing features include: abundant images, maps, and charts--all in full color sidebars addressing ethical/theological concerns and providing primary source material focus boxes isolating key issues chapter outlines, learning objectives, and summaries study and review questions Students of the New Testament will find this introductory text both informative and engaging. Nothing extraordinary. Fair price relative to other sellers online. 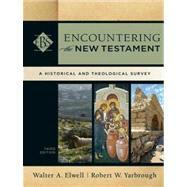 Encountering the New Testament : A Historical and Theological Survey: 4 out of 5 stars based on 1 user reviews.